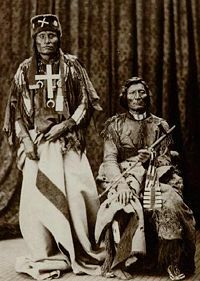 The Cheyenne are a Native American tribe that originally lived in the upper Mississippi Valley and moved north to Minnesota in the sixteenth and seventeenth centuries. They were forced to move and settled around the Sheyenne river in North Dakota in the eighteenth century. They were attacked by French fur trading interests which armed the Ojibwa by the end of the eighteenth century. Continuous assaults from both foreign and indigenous tribes forced them out onto the Plains. At this point, they split into northern and southern factions. Leaders like Black Kettle advocated for peace with the settlers, but he was shot with his tribe in 1868 by U.S. military though they offered no resistance. Spiritual traditions such as the Sun Dance and Renewal of the Sacred Arrows have kept their spiritual tradition alive to the present day despite years of persecution. 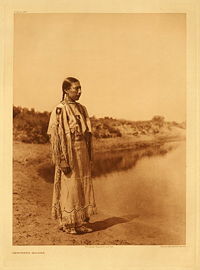 The Cheyenne are a Native American nation of the Great Plains. The Cheyenne nation is composed of two united tribes, the Sotaeo'o [no definite translation] and the Tsitsistas, which translates to "Like Hearted People" or "People who are Alike." The name Cheyenne itself derives from a Sioux word meaning "foreign talkers." During the pre-reservation era, they were allied with the Arapaho and Lakota (Sioux). The Cheyenne nation comprised ten bands, spread all over the Great Plains, from southern Colorado to the Black Hills in South Dakota. In the mid-1800s, the bands began to split, with some bands choosing to remain near the Black Hills, while others chose to remain near the Platte River of central Colorado. Cheyenne maiden photographed by Edward S. Curtis in 1930. Nothing is known about the Cheyenne people prior to the sixteenth century. They may have come north after the last Ice Age receded from the lower Mississippi Valley. The earliest known official record of the Cheyenne comes from the mid-1600s, when a group of Cheyenne visited Fort Crevecoeur, near present-day Chicago. During the 1600s and 1700s, the Cheyenne moved from the Great Lakes region to present day Minnesota and North Dakota and established villages. The most prominent of these ancient villages is Biesterfeldt Village, in eastern North Dakota along the Sheyenne River. The Cheyenne also came into contact with the neighboring Mandan, Hidatsa, and Arikara nations and adopted many of their cultural characteristics. In 1804, the Lewis and Clark visited a Cheyenne village in North Dakota. Pressure from migrating Lakota and Ojibwa nations forced the Cheyenne west. By the mid 1800s, the Cheyenne had largely abandoned their sedentary, agricultural, and pottery traditions and fully adopted the classic nomadic Plains culture. Tipis replaced earth lodges, and their diet switched from fish and agricultural produce to mainly buffalo and wild fruits and vegetables. During this time, the Cheyenne also moved into Wyoming, Colorado, and South Dakota. The Cheyenne were pushed to the west after French fur traders armed the Ojibwa. By the end of the eighteenth century, the Ojibwa destroyed the primary Cheyenne village. Many of the survivors joined other tribes. The Sioux tribes raided the Cheyenne in the early nineteenth century forcing them out of the Plains. About 1832, some moved to southern Colorado and northern New Mexico. A tribal split between northern and southern groups evolved. The group in the south formed an alliance with the Southern Arapaho. In 1851, the first Cheyenne "territory" was established in northern Colorado, granted by the Fort Laramie Treaty of 1851. Today this former territory includes the cities of Fort Collins, Denver, and Colorado Springs. Starting in the late 1850s and accelerating in 1859 with the Colorado Gold Rush, European settlers moved into the lands reserved for the Cheyenne and other Plains Indians. The influx eventually led to open warfare in the 1864 Colorado War during the Indian Wars. In November, 1864, a Southern Cheyenne and Arapaho encampment under Chief Black Kettle, flying a flag of truce and indicating its allegiance to the authority of the national government, was attacked by the Colorado Militia. This became known as the Sand Creek Massacre. Though the Cheyenne were settled peacefully in land granted them by the U.S. government in the Fort Laramie Treaty of 1851, white settlers were increasingly encroaching on their lands. Even the U.S. Indian Commissioner admitted that "We have substantially taken possession of the country and deprived the Indians of their accustomed means of support." By 1864 the conflicts had escalated. 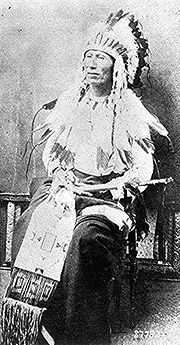 Cheyenne Chief Black Kettle had asked William Bent, the white husband of a Cheyenne woman, Owl Woman, to persuade the Americans to negotiate peace. Believing peace had been agreed upon, Black Kettle moved to a camp along Sand Creek in southeastern Colorado along with a group of several hundred Cheyenne and Arapaho. However, on the morning of November 28, Chivington and his army of 1,200 captured William Bent's son Robert, and forced him to guide them to the campsite. 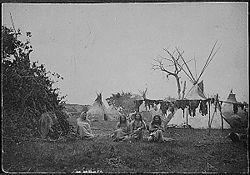 As instructed, Black Kettle was flying both the American flag and a white flag above his tipi, indicating that they were a peaceful camp. As the troops descended upon the camp, Black Kettle gathered his people under the flag, believing in its protection. Ignoring the flags, the American soldiers they savagely killed and mutilated the unarmed men, women, and children. Approximately 150 died. Four years later, on November 27, 1868, the same Cheyenne band was attacked at the Battle of Washita River. The encampment under Chief Black Kettle was located within the defined reservation and thus complying with the government's orders, but some of its members were linked both pre and post battle to the ongoing raiding into Kansas by bands operating out of the Indian Territory. Over 100 Cheyenne were killed, mostly women and children. There are conflicting claims as to whether the band was "hostile" or "friendly." 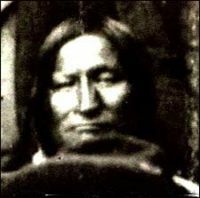 Chief Black Kettle, head of the band, is generally accepted as not being part of the war party within the Plains tribes, but he did not command absolute authority over the members of his band. Consequently, when younger members of the band participated in the raids, the band was implicated. The Northern Cheyenne participated in the Battle of the Little Bighorn, which took place on June 25, 1876. The Northern Cheyenne, along with the Lakota and a small band of Northern Arapaho, annihilated George Armstrong Custer and much of his 7th Cavalry contingent of Army soldiers. It is estimated that population of the encampment of the Cheyenne, Lakota, and Arapaho along the Little Bighorn River was approximately 10,000, which would make it one of the largest gathering of Native Americans in North America in pre-reservation times. News of the event traveled across the United States, and reached Washington, DC just as the United States was celebrating its Centennial. This caused much anger towards the Cheyenne and Lakota. Following the Battle of the Little Bighorn attempts by the U.S. Army to capture the Cheyenne intensified. A group of 972 Cheyenne were escorted to Indian Territory in Oklahoma in 1877. The government intended to re-unite both the Northern and Southern Cheyenne into one nation. There the conditions were dire; the Northern Cheyenne were not used to the climate and soon many became ill with malaria. In addition, the food rations were insufficient and of poor quality. In 1878, the two principal Chiefs, Little Wolf and Morning Star (Dull Knife) pressed for the release of the Cheyenne so they could travel back north. That same year a group of 353 Cheyenne left Indian Territory to travel back north. This group was led by Chiefs Little Wolf and Morning Star. The Army and other civilian volunteers were in hot pursuit of the Cheyenne as they traveled north. It is estimated that a total of 13,000 Army soldiers and volunteers were sent to pursue the Cheyenne over the whole course of their journey north. There were several skirmishes that occurred, and the two head chiefs were unable to keep some of their young warriors from attacking small white settlements along the way. After crossing into Nebraska, the group split into two. Little Wolf and his band made it back to Montana. Morning Star and his band were captured and escorted to Fort Robinson, Nebraska. There, Morning Star and his band were sequestered. They were ordered to return to Oklahoma but they refused. Conditions at the fort grew tense through the end of 1878 and soon the Cheyenne were confined to barracks with no food, water, or heat. Finally there was an attempt to escape late at night on January 9, 1879. Much of the group was gunned down as they ran away from the fort, and others were discovered near the fort during the following days and ordered to surrender but most of the escapees chose to fight because they would rather be killed than taken back into custody. It is estimated that only 50 survived the breakout, including Morning Star. Several of the escapees later had to stand trial for the murders which had been committed in Kansas. The remains of those killed were repatriated in 1994. 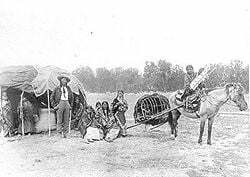 Stump Horn and family (Northern Cheyenne); showing home and horsedrawn travois. Over the past four hundred years, the Cheyenne have gone through four stages of culture. First, they lived in the Eastern Woodlands and were a sedentary and agricultural people, planting corn, and beans. Next, they lived in present day Minnesota and South Dakota and continued their farming tradition and also started hunting the bison of the Great Plains. During the third stage the Cheyenne abandoned their sedentary, farming lifestyle and became a full-fledged Plains horse culture tribe. The fourth stage is the reservation phase. The Cheyenne of Montana and Oklahoma speak the Cheyenne language, with only a handful of vocabulary items different between the two locations (their alphabet only contains 14 letters that can be combined to form words and phrases). The Cheyenne language is part of the larger Algonquian language group, and is one of the few Plains Algonquian languages to have developed tonal characteristics. The closest linguistic relatives of the Cheyenne language are Arapaho and Ojibwa (Chippewa). The Cheyenne believe in an Original Creator. There were two primary deities called "the Wise One Above" and "the God who Lives in the Earth." There were four spirits at each direction; east, west, south, and north. The Sun Dance was central to Cheyenne ritual. This dance was held each summer. Dancers were pierced with a thong through their breast muscles and hung while dancing and gazing into the sun while entering a trance. Also significant were the Arrow Renewal and the Animal Dance. The Renewal of the Sacred Arrows involved the four sacred arrows that legend told were received from the Great Spirit by Sweet Medicine, the ancestral hero of the tribe, following his pilgrimage to the Sacred Mountain. The sacred arrows were kept with other tribal objects, signifying the collective existence of the tribe. Periodically, the Cheyenne bands gathered together for a ceremony in which they performed a series of rituals to renew the arrows and so renew the tribe. The Animal Dance was a hunting ceremony, also received by Sweet Medicine at the Sacred Mountain, to bring success to the hunters. The women were involved in the preparation for this ceremony. Men dressed up as animals and members of the Bowstring Society pretended to hunt them, but they did everything backwards to the great amusement of all. In more recent times, the Peyote North American Church has become a part of religious life. Spiritual cleansing before any religious ceremony in a sweat lodge was and continues to be of importance for purification. A revival of interest in the old traditions is in progress. The traditional Cheyenne government system is a politically unified North American indigenous nation. Most other nations were divided into politically autonomous bands, whereas the Cheyenne bands were politically unified. The central traditional government system of the Cheyenne was the "Council of Forty-Four." The name denotes the number of seated chiefs on the council. Each band had four seated chief delegates; the remaining four chiefs were the principal advisers of the other delegates. This system also regulated the many societies that developed for planning warfare, enforcing rules, and conducting ceremonies. This governing system was developed by the time the Cheyenne reached the Great Plains. The influence of the Council of Forty-Four waned in the face of internal conflict among the Cheyenne about Cheyenne policy toward encroaching white settlers on the Great Plains, and was dealt a severe blow by the Sand Creek Massacre. Besides causing a heavy loss of life and material possessions by the Cheyenne and Arapaho bands present at Sand Creek, the massacre also devastated the Cheyenne's traditional government, due to the deaths at Sand Creek of eight of 44 members of the Council of Forty-Four, as well as headmen of some of the Cheyenne's military societies. Among the chiefs killed were most of those who had advocated peace with white settlers and the U.S. government. The effect of this on Cheyenne society was to exacerbate the social and political rift between the traditional council chiefs and their followers on the one hand and the Dog Soldiers on the other. To the Dog Soldiers, the Sand Creek Massacre illustrated the folly of the peace chiefs' policy of accommodating the whites through the signing of treaties such as the first Treaty of Fort Laramie and the Treaty of Fort Wise and vindicated the Dog Soldiers' own militant posture towards the whites. 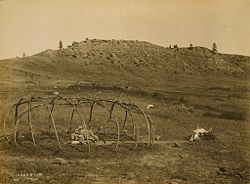 The Council of Forty-Four was one of the two central institutions of traditional Cheyenne tribal governance, the other being the military societies such as the Dog Soldiers. The Council of Forty-Four was the council of chiefs, comprising four chiefs from each of the ten Cheyenne bands plus four principals  or "Old Man" chiefs who had previously served on the council with distinction. Council chiefs were generally older men who commanded wide respect; they were responsible for day-to-day matters affecting the tribe as well as the maintenance of peace both within and without the tribe by force of their moral authority. While chiefs of individual bands held primary responsibility for decisions affecting their own bands, matters which involved the entire tribe such as treaties and alliances required discussions by the entire Council of Forty-Four. Chiefs were not chosen by vote, but rather by the Council of Forty-four, whose members named their own successors, with chiefs generally chosen for periods of ten years at councils held every four years. Many chiefs were chosen from among the ranks of the military societies, but were required to give up their society memberships upon selection. Council chiefs selected which of the six military societies would assume these duties; after a period of time on-duty, the chiefs would select a different society to take up the duties. Northern Cheyenne warrior leader Roman Nose. Bowstring Men (Himatanohis) or Wolf Warriors (Konianutqio); among the Southern Cheyenne only. Foolish or Crazy Dogs (Hotamimasaw); similar to the Bowstrings, but found only among the Northern Cheyenne. Crooked Lance Society (Himoiyoqis) or Bone Scraper Society. This was the society of the famous warrior Roman Nose, and also of the mixed-blood Cheyenne George Bent. Beginning in the 1830s, the Dog Soldiers had evolved from the Cheyenne military society of the same name into a separate, composite band of Cheyenne and Lakota warriors who took as its territory the headwaters country of the Republican and Smoky Hill rivers in southern Nebraska, northern Kansas, and the northeast of Colorado Territory. Prior to the peace council held at Bent's Fort in 1840, there was enmity between the Cheyennes and Arapaho on one side and the Comanches, Kiowas, and Plains Apaches on the other. In 1837, while raiding the Kiowa horse herds along the North Fork of the Red River, a party of 48 Cheyenne Bowstring Men were discovered and killed by the Kiowas and Comanches. Porcupine Bear, chief of the Dog Soldiers, took up the war pipe of the Cheyenne and proceeded to carry it to the various Cheyenne and Arapaho camps in order to drum up support for revenge against the Kiowas. He reached a Northern Cheyenne camp along the South Platte River just after it had traded for liquor from American Fur Company men at Fort Laramie. Porcupine Bear joined in the drinking and becoming drunk, became involved in a fight resulting in killing his cousin. By the rules governing military societies, a man who had murdered or even accidentally killed another tribe member was prohibited from joining a society, and a society member who committed such a crime was expelled and outlawed.Therefore Porcupine Bear for his act of murder was expelled from the Dog Soldiers and, along with all his relatives, was made to camp apart from the rest of the tribe. The Dog Soldiers were also disgraced by Porcupine Bear's act. Though outlawed by the main body of the Cheyenne tribe, Porcupine Bear led the Dog Soldiers as participants into battle against the Kiowas and Comanches at Wolf Creek; they were reportedly the first to strike the enemy. Due to their outlaw status, however, they were not accorded honors. The outlawing of Porcupine Bear, his relatives, and his followers led to the transformation of the Dog Soldiers from a military society into a separate division of the tribe. In the wake of a cholera epidemic in 1849 which greatly reduced the Masikota band of Cheyennes, the remaining Masikota joined the Dog Soldiers; thereafter when the Cheyenne bands camped together, the Dog Soldier band took the position in the camp circle formerly occupied by the Masikota. Prominent or ambitious warriors from other bands also gradually joined the Dog Soldier band, and over time as the Dog Soldiers took a prominent leadership role in the wars against the whites, the rest of the tribe began to regard them no longer as outlaws but with great respect. By the 1860s, as conflict between Indians and encroaching whites intensified, the influence wielded by the militaristic Dog Soldiers, together with that of the military societies within other Cheyenne bands, had become a significant counter to the influence of the traditional Council of Forty-Four chiefs, who were more likely to favor peace with the whites. The Dog Soldiers contributed to the breakdown of the traditional clan system of the Cheyennes. Customarily when a man married, he moved to the camp of his wife's band. The Dog Soldiers dropped this custom, instead bringing their wives to their own camp. In Cheyenne society, the family was the most important unit, then the clan, and then the tribe as a whole. There is a controversy among anthropologists about Cheyenne society organization. When the Cheyenne were fully adapted to the classic Plains culture, they had a bi-lateral band kinship system. However, some anthropologists note that the Cheyenne had a matrilineal band system. Studies into whether the Cheyenne ever developed a matrilineal clan system are inconclusive. The Cheyenne had very strict rules about behavior inside and outside their family and clan. There was a taboo against extra-marital sexual activity. 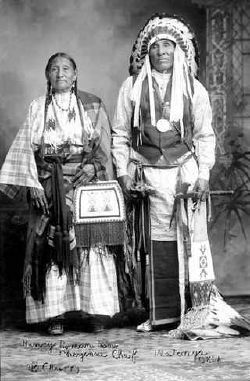 Cheyenne women were prized for their purity, and were desired as wives only if they were virgins who had behaved properly prior to marriage. They also had a long and complicated courtship procedure. Today, the Northern Cheyenne live in southeast Montana on the Northern Cheyenne Indian Reservation. The Southern Cheyenne, along with the Southern Arapaho, live in central Oklahoma. Healthcare is of great concern to the Cheyenne as with most other tribes. Wellness clinics are under construction to address growing health problems with diabetes, obesity, substance abuse, and teen suicide. The focus is on prevention and life style change. It has been suggested that a return to eating buffalo meat and other local produce is one way that life style changes can improve health outcomes while keeping alive traditions and local farming business. Chief Dull Knife College, a Native American tribal community college and land grant institution, is located on the reservation in Lame Deer. The reservation is the recipient of a 2010 Promise Neighborhoods grant from the United States Department of Education, through the local Boys & Girls Clubs of America. Through determination and sacrifice, the Northern Cheyenne had earned their right to remain in the north near the Black Hills. The Cheyenne also had managed to retain their culture, religion, and language intact. Today, the Northern Cheyenne Nation is one of the few American Indian nations to have control over the majority of its land base, currently at 98 percent. In partnership with Southwestern Oklahoma State University, the tribe founded the Cheyenne and Arapaho Tribal College on August 25, 2006. Its first president Dr. Henrietta Mann, enrolled tribal member, was inaugurated on April 3, 2008. The college offered Associate in Science degrees in Tribal Administration, Children's Teachers, American Indian Studies, and General Studies and Harjo had graduated 55 students prior to closing in 2015. Suzan Shown Harjo, Southern Cheyenne and Muscogee (Creek), Founding Trustee, Smithsonian National Museum of the American Indian; President, Morning Star Institute (A Native rights advocacy organization based in Washington, DC). Chris Eyre, Southern Cheyenne and Southern Arapaho, Movie Director, notable film: "Smoke Signals." ↑ 1.0 1.1 Northern Cheyenne Tribe Retrieved October 25, 2018. ↑ Oklahoma Indian Affairs,Oklahoma Indian Nations Pocket Pictorial Directory Retrieved October 25, 2018. ↑ 3.0 3.1 B. Pritzker, A Native American Encyclopedia: History, Culture, and Peoples (Oxford University Press, 2000, ISBN 0195138975). ↑ Save the Sheyenne River Retrieved October 25, 2018. ↑ Legends of America, Chief Black Kettle - A Peaceful Leader Retrieved October 25, 2018. ↑ Dee Alexander Brown, Bury my heart at Wounded Knee; an Indian history of the American West (New York: Holt, Rinehart & Winston, 1971, ISBN 0030853222). ↑ 7.0 7.1 7.2 Carl Waldman, Encyclopedia of Native American Tribes (New York, NY: Checkmark Books, 2006, ISBN 978-0816062744). ↑ 8.0 8.1 8.2 8.3 8.4 Jerome A. Greene Washita, The Southern Cheyenne and the U.S. Army. Campaigns and Commanders Series, vol. 3. (Norman, OK: University of Oklahoma Press, 2004, ISBN 0806135514). ↑ 9.0 9.1 9.2 9.3 9.4 9.5 9.6 Stan Hoig, The Peace Chiefs of the Cheyennes (Norman, OK: Univ of Oklahoma Press, 1980 ISBN 0806115734). ↑ 10.0 10.1 10.2 10.3 10.4 10.5 10.6 10.7 George E. Hyde, Life of George Bent Written from His Letters (Norman, OK: University of Oklahoma Press, 1968, ISBN 0-80610157707). ↑ U.S. Department of Education, U.S. Department of Education Awards Promise Neighborhoods Planning Grants Retrieved October 25, 2018. ↑ The Cheyenne and Arapaho Tribal Tribune Retrieved October 25, 2018. ↑ Cheyenne and Arapaho Tribal College to close at semester end Enid News and Eagle, April 22, 2015. Retrieved October 25, 2018. Hyde, George E. Life of George Bent Written from His Letters. Norman, OK: University of Oklahoma Press, 1968. ISBN 0806115777. This page was last modified on 25 October 2018, at 23:27.